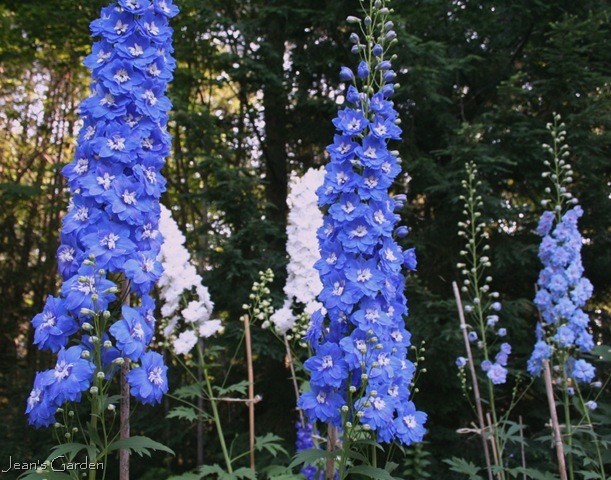 Nothing says summer in a cool-climate garden quite like the tall spires of Delphinium elatum. I included delphinium early in my gardening efforts here, but my early attempts to grow these plants were those of a serial delphinium killer. I would buy a delphinium in bud from a local nursery and stick it in the ground. The delphinium would grow and bloom and look beautiful, and then it would disappear. The next year, I would go out and buy another one and do the same thing all over again. Occasionally, one would come back a second year, but that was rare. Eventually I learned something about what these plants needed to thrive (rich, moist, sweet, well-drained soil), realized that (except for the well-drained part) I wasn’t providing any of that, and stopped trying to grow them. I didn’t give up my desire for delphinium, though, and when I began to plan the blue and yellow border in the back garden, I decided to make an extra effort to create a hospitable home for these plants. This flower bed is fairly large, and I set aside an area of about 40 square feet for delphinium. There, I dug in extra manure for richer soil and an extra measure of wood ash to sweeten my acidic soil. Unlike the vegetative propagation typical of most perennial cultivars, delphinium varieties are usually grown from seed and identified by their seed “strains.” My early delphinium growing attempts were with the strain most widely available in the United States at that time, the Pacific Giant varieties, which were bred in the Pacific northwest and particularly well suited to that climate. By the time I was ready to try delphinium again in 2004, I found that my local nursery no longer offered the Pacific Giants, but was instead growing and selling the New Millennium strain developed in New Zealand by Dowdeswell’s Delphiniums. 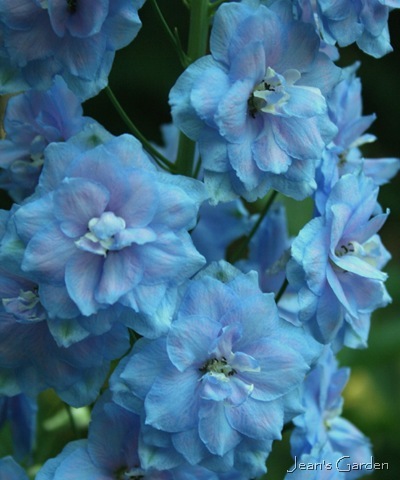 Like other delphiniums, these come in a lovely array of colors in the blue-violet-pink range. I currently have four different varieties growing in my garden: ‘Double Innocence,’ ‘Blue Lace,’ ‘Royal Aspirations’ and ‘Pagan Purple.’ Not only are the delphinium spires a stunning presence in the garden, but the individual flowers are also beautiful. and by the rich mixture of blue and violet in these ‘Pagan Purple’ flowers. The New Millennium delphiniums have been widely hailed as being tougher, more vigorous plants than the Pacific Giants and more tolerant of heat and humidity. Dowdeswell’s rates them for USDA zones 3-8. In many climates, if they are deadheaded after the first bloom, they will send up new growth and produce a new set of flowers later in the season. Like all delphinium, however, these are not carefree garden plants. 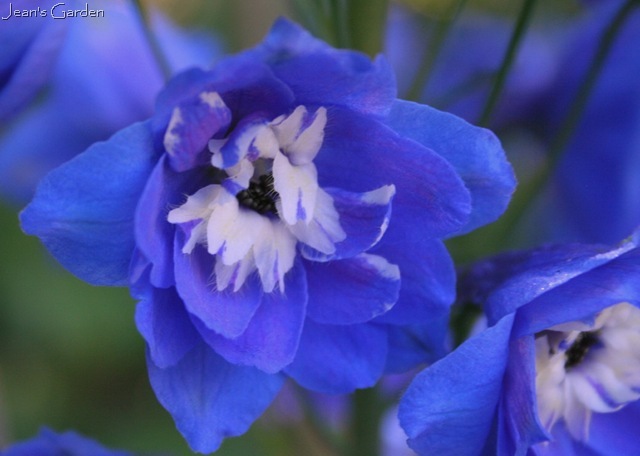 Delphinium tend to be relatively short-lived and seldom survive more than five years. They are also heavy feeders; I find they are more likely to thrive if I fertilize them twice each season, once in spring and once when the second flush of growth begins. Donna and Steve Palmer at Plainview Farm, where I buy mine, recommend limiting the number of flower stems in the first years as the plants are getting established. Their formula is to allow only two stems to develop in the first year, three stems in the second year, four stems in the third year, etc., and never more than five stems on a single plant. Allan Becker recommends dividing the plants every three years. Delphinium are probably not a good choice for gardeners who hate to have stakes showing in their gardens; because these plants absolutely must be staked. The blooming inflorescences alone are typically 30-36” tall, and that is on top of stems averaging more than 3’. I use one sturdy 6’ bamboo stake for each 1-2 delphinium stems. It is important that the stake be strong enough to support the weight of the fully blooming spire and that it be long enough so that, after about 1’ is sunk in the ground, the stake is still tall enough to reach the lower part of the inflorescence. I tie each stem to the stake at several points along its length, with the top tie in the bottom part of the inflorescence. If, despite my best efforts, I look out after a heavy rain to find a bent stem and a delphinium spire pointing at the ground, I go out with a pair of scissors, cut the stem, and bring the blooming delphinium in as a cut flower for the house. Because, whether inside or out, delphiniums are delightful. I also hate see the stakes, if only someone would invent a great (invisable) delph stake, they would make a fortune. They certainly are lovely. Very Delightful!! I love the Double Innocence. I bet you are glad that you kept trying to grow these beautiful blooms. I had the sme experience with Delphiniums, they never came back. I would love to try them again,maybe next year. I did find a stake that works very well with tall phlox- green metal with a little double circle at the top. It is invisible in the garden. The pholox is about 40″ high and it works. Those are some amazing Delphiniums! Those are the one flower I’m sad I can’t get to grow here. To me they are part of what I love about cottage gardens. My experience with them is exactly what you described yours was. I even tried the Pacific Giants, no luck. I will keep an eye out for the New Millennium variety here, thanks for all this helpful information! Jean, this was a particularily interesting read for me because just yesterday I was shopping for some delphiniums. I was admiring the ‘Double Innocence’ at the store, but as I was looking for something tall for the back of my border I chose ‘Astolat’. I wanted a light coloured one for contrast, and it’s kind of hard to tell from the tag photo but it seems to be a light pink or mauve. You have a wonderful collection of delphiniums. I loved reading about your determination to try and try again, and work with these fussy but beautiful plants until you had success. You certainly have learned what they want and you have the wonderful results to show for it! They are simply beautiful … congratulations on sticking with it! The rewards are stunning. They are so beautiful and my favorite colors too, that deep purple-blue. I’ve tried them here but that was years ago and they always got some sort of mildew or fungus. And like your early ones didn’t come back. Glad you were successful though, well worth it. When I was 18 and first went crazy for flower gardening, I planted six Pacific Giant delphiniums in my parents’ yard behind the rose garden I was creating. I thought it would be so lovely, like a wall of blue — but in reality they performed pitifully, their few blooms needing major staking, and then they never came back. I hadn’t thought of that in years, until this post. If ever I get a bit of land for my dream cottage garden, I may try again, keeping in mind to build up the soil for a heavy feeder with a sweet tooth. 😉 Your gorgeous photos are certainly inspiring, Jean. I especially appreciate the pure blue flowers with black “bees” at their heart. Fabulous! Your dephiniums are so lovely. We struggle with them here in zone 9A but plant them just the same, in the winter. We certainly never get the performance, even in cooler weather, that you do. These are beautiful. Thanks for sharing! wow they have some turly grand stalks of blooms, realy lovely. 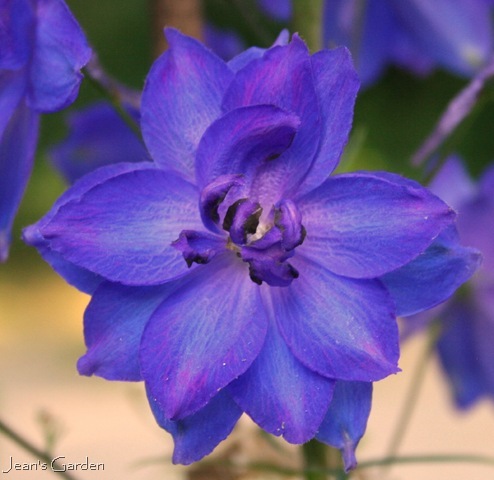 Jean, I’m so glad to read that I’m not alone in my murky past as a serial Delphinium killer! Now I know why. The garden I tried to grow those in had the most horrendous clay soil, and despite amending it, I’m sure it was never what the poor plants needed. You give me hope though, if I should venture to try planting these again. Your Delphiniums are absolutely picture perfect! This is so funny. 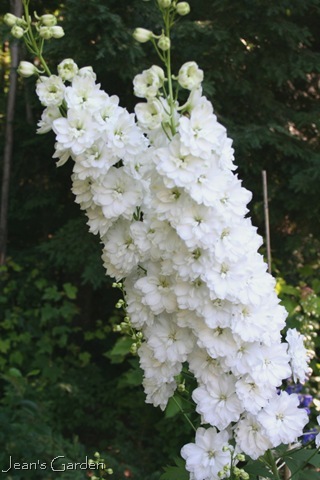 I just responded to your comment on my blog by saying, “but I can’t grow delphiniums”! These are beautiful and I’m envious. BTW, you are the winner of the customer header drawing so send me a photo and let’s discuss details! Your Blue Lace delphinium has a sublime color, and I admire how you kept your desire to grow them and are having success now. I always want to buy delphiniums when I see blue ones for sale and maybe I will buy one to try it. I am growing ‘Pagan Purples’ and ‘Green Twist’ from Dowedswell, and feeling guilty because I haven’t staked them this year and they’re flopping all over. Many are as tall as I am. I need to reduce the number I have planted so it’s not so overwhelming to take care of them. I also failed to remove extra stems, so many clumps have 7 or 9 stems coming up. It’s a learning process, for sure! Yours look beautiful and very straight! Hello Everyone, Thanks for visiting, and I’m glad you’ve enjoyed my delphiniums. Amy, Laurrie, Bernie, Noel, and Sunny, I just had to keep trying with delphinium because I could see others growing them successfully in my area and because I think of them, like peonies, as quintessential perennial garden flowers. Clare, LOL, I suspect that an organization of serial delphinium killers would have a very large membership. Elizabeth, I’m amazed that you manage to grow delphinium at all in zone 9a. But Dowdeswell’s claims to have testimonials from people in Florida growing them as annuals. Eileen, Catherine, Helen, Terra, and Meredith, If you decide to try them again, look for the New Millennium strain. They really are easier to grow. According to Dowdeswell’s web site, Butchart Gardens has switched from Pacific Giants to New Millenium. Noel, the variety is even greater than my post indicates. Because these flowers are grown from seed, no two are ever exactly alike. For example, I have two Blue Lace, one of which is more lavender than the other, and two Royal Aspirations, one of which is more royal blue and one of which is closer to navy blue. My experience with Pagan Purple is that you can get two or more different color inflorescences on the same plant. VW, Has that been your experience with Pagan Purple? Are you growing them from seed? If so, how long does it take from planting until you get flowers? Diane, I’m surprised that you ended up passing over Double Innocence because you were looking for something taller; it grows very tall (about 6′) in my garden. Dowdeswell’s says that heights can vary depending on a variety of growing conditions, and mine seem to be at about the maximum height. Rebecca and Deborah, The discussion of stakes and Eileen’s experience with stakes for her phlox led me to do a web search to see what I could find. The issue with delphiniums is that their stems are hollow and therefore not all that strong, while the fully blooming inflorescences can be very heavy — especially when they get wet. Yesterday, just as almost all my flower spires were fully open, we had torrential rain, and the flowers became so heavy that the stems simply could not support them; almost every one ended up bent over just above the highest point where I had tied it to the stake. (I now have cut delphiniums in every room of the house!) The only way to avoid this would be to tie the top of the inflorescence to the stake, but that would require stout 7′ tall stakes. In looking for other alternatives, I ended up at the web site of Gardener’s Supply Company. They have many different types of plant supports, but most of them (including their so-called tall plant supports) just weren’t tall enough. The most intriguing possibility was something they call “garden grids”. These are rectangles of green plastic-coated wire about a meter long and 20″ high and with 5″ square openings. They can be arranged in a circle (39″ circumference) around the outside of the plant and they can be stacked on top of one another as high as you need them. I can imagine that the bottom of the grid might pretty much disappear if the foliage grew out through it. The developing inflorescences could then grow out through the grid and be tied to it on the outside. This might allow support all the way to the top and be pretty close to invisible. They’re fairly expensive, but I might buy a couple of sets to try next year and see how they work. Melissa, I’m thrilled that I won your contest. Now I have to find a photo that would be suitable. I’ll be in touch. But I have read about these new ones being hardier and sturdier .. one day I might just break down and try these out. Yours are perfectly beautiful : ) .. those shades of blue are truly stunning ! How lovely! I would’ve been over the moon having something so beautiful blooming for me but my tropical garden turns its nose up at the very idea. Your summer flowers are winter growers for us here in Mumbai . I really must plan on giving it one more try and get some seeds this year. This is too beautiful not to give it a second (or hundredth!) chance. I’ve tried delphiniums in several gardens, but they really don’t like the humidity of the mid-Atlantic or deep South. But the only success I had in planting them were for gardens I worked on in Kittery Maine, and in Prout’s Neck, Maine. Delphiniums really love your climate. I love your choice of a blue and yellow border. Delphiniums are such a great flower. My mother always kept them on the west coast but with the wind and rain we receive here I don’t know if I could ever keep them successfully. Best of luck to you in keeping them upright! This is a wonderfully designed blog and I’m so thrilled to see such discussion about our delphiniums. Thank you Jean for showcasing them. Perhaps your friends would also be interested in our company facebook and my blog. Links via our web site. Thanks again Jean for providing such a great lift to our day. It’s a thrill to see our plants grown so well and giving such pleasure. Joy, Hardier and sturdier are relative terms — and these are still delphiniums. But I love them so much that I think they’re worth some extra effort; and these New Millenniums have rewarded my efforts. Thomas, I think the coast of Maine is where I first saw them and fell in love with them; I’m surprised they aren’t bothered more by the winds along the coast. Although having said that, Marguerite, I think PEI winds are something else. I remember that on my one and only PEI vacation, I set off on a long bicycle ride one day, only to find myself getting off my bicycle to push it down a hill because the headwinds were so strong! Terry, Thanks for visiting and for reminding us all that Dowdeswell’s web site is full of wonderful information, including your blog. You have inspired me to try again next year. Wow. Delphinium elatums are really gorgeous! I would love to have them standing in front of my porch! The other ones are also really beautiful! I envy you, having such beautiful flowers! The blue ones are my favorites! Donna, I don’t know where you are gardening, but you might see if you can get the New Millenniums. The most important lesson I’ve learned from my delphinium adventures is that this is one plant where preparation is 90% of success; it’s important to figure out how your soil should be prepared ahead of time to give them the most hospitable conditions. They are gorgeous! They are mostly gone by for the time being (although they are starting to put of new growth for another flush of blooms in the fall), but I’m still enjoying them in vases in the house. Jack, One of the advantages I’ve found of using Google Reader to read blog posts is that I can flag (star) those that I want to save for future reference. The next step is to find some way to organize/tag the starred ones into categories. Love your delphinium flowers! Manure compost is really the best thing to make your soil healthy! My garden is mulch with manure compost and it is effective. All of my plants are healthy and gorgeous especially my day lilies! 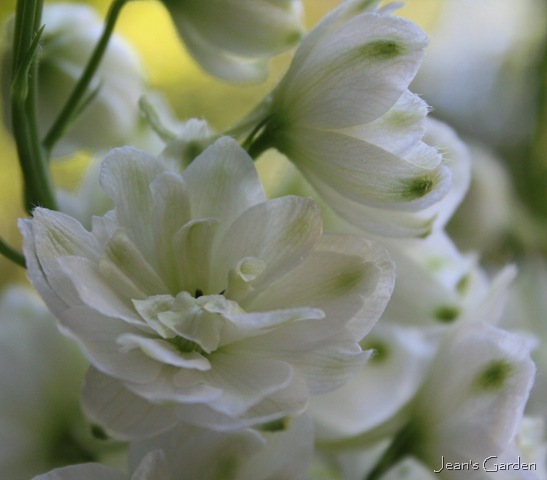 I like the white delphinium! It signifies purity. Jean,your e-mail subscription is currently reposting your delphinium article. I found a way to hide my stakes last year. I have a vigorous well protected delph that I put one hefty weathered cedar post a bit taller than the greenery portion of the plant near the center, and as it’s branches stretched up I looped green garden twine securing it between this one post and and making lasso type knots about each flower stalk. Between my birdhouses I like to grow gladiolas and hollyhocks: by adding a few sturdy posts strategically amongst the birdhouse posts I and keep quite a large patch of them vertical in some very stiff wind, yet they are able to sway without breaking. Have you tried using old pantyhose cut into continuous strips as support twine? It has the perfect give not to strangle a growing stalk yet plenty of spring to keep it tautly in place. Sheila, I have no idea why my email subscribers are suddenly getting this post again; the idea of a computer program developing a mind of its own reminds me of Hal, the rogue computer in 2001: A space Odyssey. I’m glad to have an explanation, though, of why so many people have suddenly been reading this old post! Thanks for the staking tips. Hi Philip, Just follow the link above to Dowdeswell’s Delphiniums. You can order seed online directly from them. I think they ship seed all over the world. The white blooms reminds me of the flowers we wear in our hair. Love them. PS, I followed the Frustrated Gardener and latched onto your blog. Thank you for allowing the visits.